MG confirmed that it will return to the Dunlop MSA British Touring Car Championship in 2015 with the MG6 GT. MG’s BTCC engineering partner, Triple Eight Race Engineering, is working on an exciting new-look driver line-up for 2015, which will see the MG6 GT’s re-branded and given a fresh look, courtesy of a host of new sponsors joining the team next year. 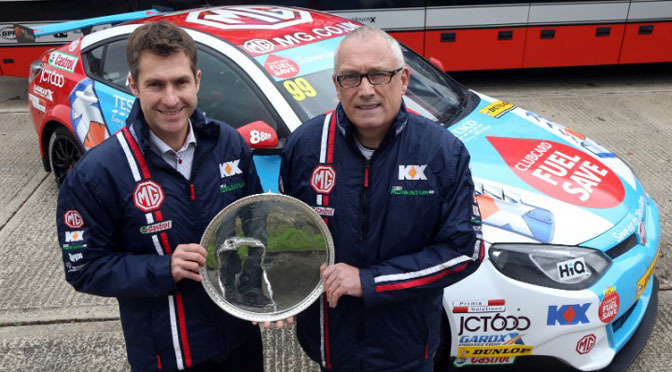 Cheyne, continued: “The MG brand is iconic and Triple Eight are the most successful team in the history of BTCC, as such together we are an attractive proposition and believe we will be in contention to defend our title next year. The BTCC has never been in such good shape and with a full grid containing a wide range of manufacturers and models, plus rising attendance and viewing figures, I am excited at the prospects for 2015 for MG, Triple Eight, our drivers, sponsors and of course our loyal and growing worldwide MG fan base. MG is currently the fastest growing automotive brand in the UK with sales up 573 percent year to date (SMMT data). The MG6 is already a favourite with MG owners for its drivability, affordability and exceptionally high levels of standard equipment included and was also voted by owners to be the Best Handling and sixth overall Best Car to Own in the 2014 Auto Express Driver Power Awards.